Fall in Washington isn’t complete without the smell of BBQ cooking on the waterfront. The annual Smoke on the Water, presented by Washington Noon Rotary, will be held this year on Saturday, October 21st. This year’s event will feature a BBQ contest, chili cook-off, 5K race, car show, vendors, music and more. If you’re planning to take in the ECU vs. BYU, be sure to come downtown and pick up your BBQ for tailgating. Belhaven ~ Darleen’s Flamingo 5K, 9am. 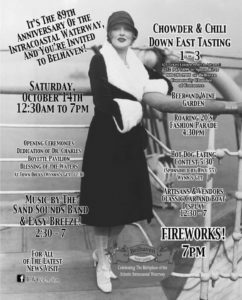 Belhaven ~ ICW Celebration, all day. Two of our local favorites are ending for the season, so now is the time to take them in! Saturday Farmer’s Market, located on the corner of Bonner and Water Streets, will continue through the end of the month. Drop by every Saturday morning from 8 am to noon to see what is fresh that week. WE think its the perfect time to enjoy a boat ride, especially when it’s free! River Roving at the NC Estuarium is available twice a day Wednesday through Friday and once on Saturday. Call 252.948.0000 for reservations. As always, you can see a complete calendar of upcoming events at www.VisitWashingtonNC.com. "Washington is one of the most beautiful cities we've ever visited. We love that the downtown is so vibrant. That really says a lot about the character of the town."